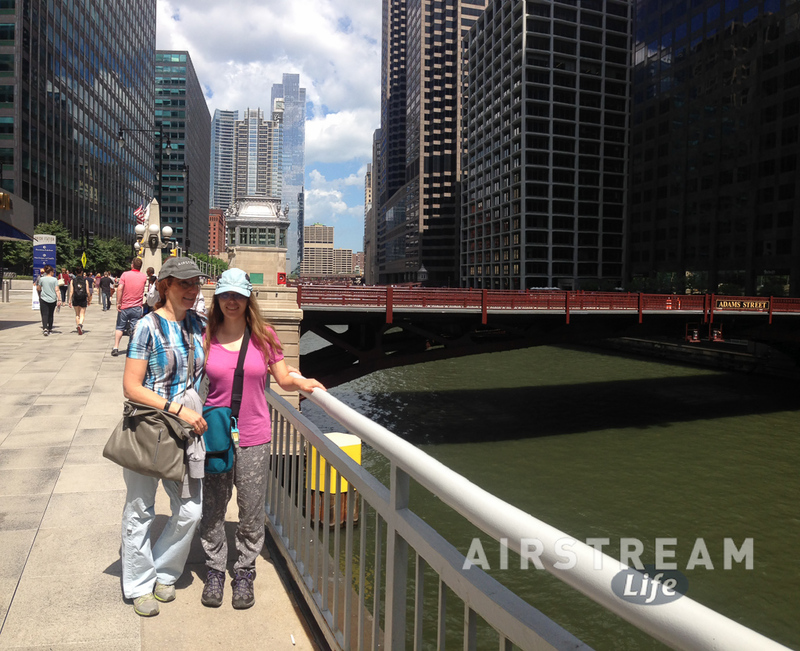 The weather in Chicago turned so ideal that we decided to extend our stay for a fourth day, to walk the downtown and just be brainless tourists. The ability to make a spontaneous change of plans is one of the things I like most about traveling by Airstream. Other than enjoying a leisurely view of a major city, the best reason to walk is to justify eating as much as possible along the way. Chicago is a great place to graze, so we started with the French Market, which is just the sort of place Eleanor loves best. Thirty or so food stalls means a minimum hour-long visit. I don’t mind. I bought a Honeycrisp apple and sliced it up with my pocket knife to share with Emma, just to stave off the constant impulse to eat everything we saw. After resisting pastries, kabobs, chocolates, seafood, and much more, we finally lost our control at the cheese counter. The cheese at left is an example of what went into my backpack that morning. 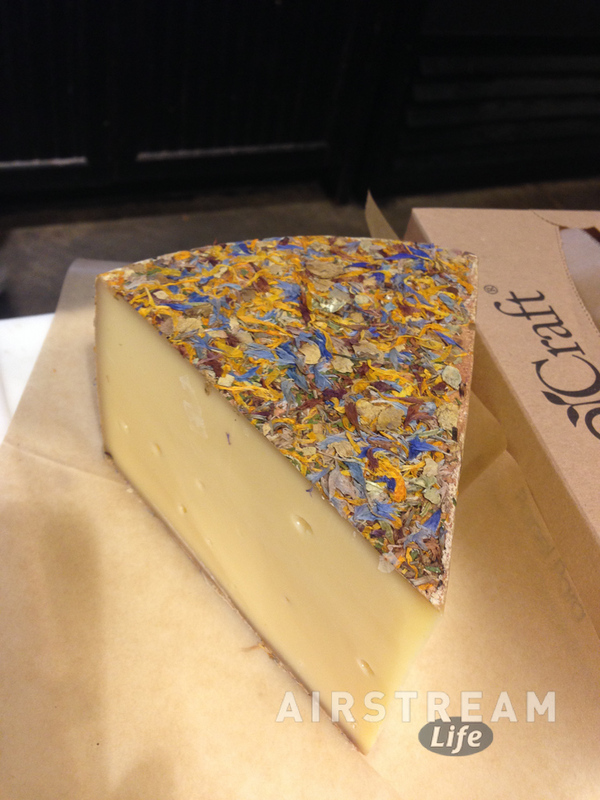 It’s called Alp Blossom and the colorful rind is compressed and dried flowers. The taste is magnificent. If you try it, don’t waste it on a cracker. Just nibble it and savor it. Besides, at $20/lb. it’s not the kind of cheese you melt over nachos! We lingered at a sidewalk cafe over French pastries and coffee. I think it was probably over two hours before we even left the block. And then on to Union Station, crossing the Chicago River (one of several times), past the “Willis” Tower (which everyone knows is forever the Sears Tower), up State, along the Riverwalk, and over to Navy Pier. We stopped and browsed enough that this took most of the day. Another cab ride brought us to Chinatown that evening, where we got dinner and then headed back to (home sweet home) the truck parking lot and our Airstream. Eleanor’s comment that night was that she’d like to come back to Chicago to explore some more. Maybe even catch a live show of “Wait Wait Don’t Tell Me”. It’s ironic that we all felt that way, because we started this visit with a sense of dread—Oh no we’ve got to tow the Airstream into a major city— and it became a really memorable and fun visit. 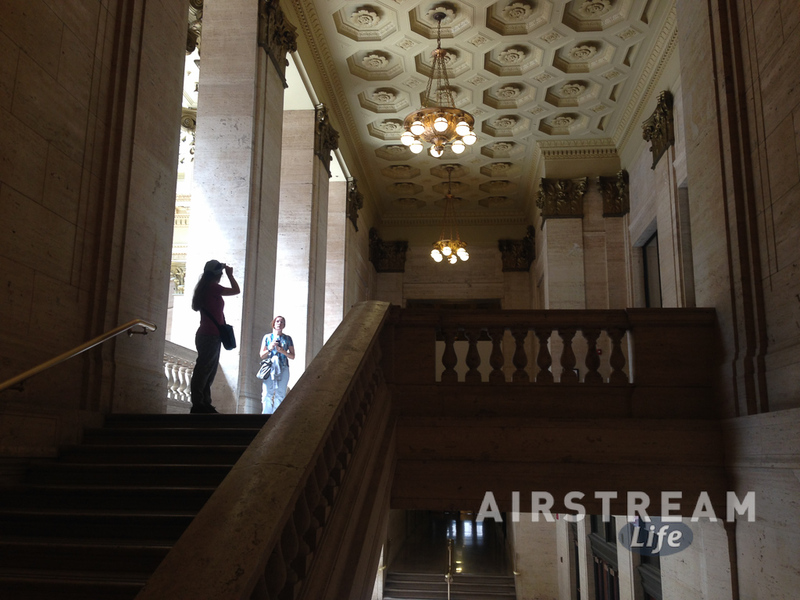 I may have re-think my attitude toward major metros, and begin to embrace the advantages of urban camping.